Weijer, F. de, and U. Kilnes. 2012. Strengthening civil society? 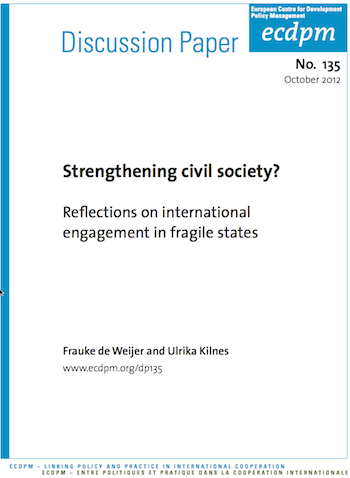 Reflections on international engagement in fragile states, (ECDPM Discussion Paper 135). Maastricht: ECDPM. Recognition of the importance of civil society has risen on the international agenda in recent years. Increasingly civil society organisations are an integral part of policy negotiations, at both the national and the supra-national levels. In aid effectiveness fora, the involvement of civil society has gained momentum. In addition, the number, capacity and legitimacy of southern civil society organisations has increased substantially in past decades. Within the area of international development cooperation, fragile states have emerged as a particular point of attention, with explicit recognition that different approaches are necessary to support these countries in a transition towards increased resilience. This changing landscape has redefined the context in which donors and civil society organisations operate, in the North as well as in the South. This discussion paper addresses a number of issues related to this changing landscape. It aims to contribute to knowledge on the specific characteristics and challenges of engaging with civil society in fragile states, as well as on the changing role of northern Civil Society Organisations (CSOs). Its insights will be of particular relevance for donors and civil society in the North. An active civil society is essential in fragile states and has several vital roles to play. However, it is often polarised and fragmented, posing real challenges for external actors to engage in this field. Engaging with civil society in fragile states is far from risk-free, and a conflict-sensitive approach is essential. External actors will need to seek ‘smart partnerships’ with civil society of various natures and look creatively for ways to strengthen state-society relations through engagement with a broad variety of existing actors and formal and informal institutions. The gradual strengthening of civil society in the South, increased South-South cooperation and establishment of North-South and East-West linkages can lead to a changing role for northern civil society. Their part in addressing the external drivers of fragility remains of high importance, as does their role in providing linkages to global civil society with the enhanced legitimacy and protective force that these bring. Northern civil society organisations will also continue to be essential partners for southern civil society in terms of funding, capacity development support and knowledge sharing, but the nature of these partnerships needs to change. A number of elements will be essential to this shift: broader outreach to the less formal and organised civil society; stronger focus on identifying and creating synergies with other actors such as the private sector, local government and informal institutions; deliberate strategies for increasing the autonomy of southern partners; and a type of capacity development support that centres on southern organisations’ abilities to frame their agenda, to conduct policy analysis and to identify opportunities for engagement in national or global policy arenas. There is a need to come up with innovative and contextualised mechanisms that can serve these aims.